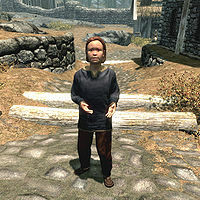 Lars Battle-Born is a Nord child of Alfhild and Idolaf Battle-Born living in Whiterun. He can be found walking around Whiterun or inside his family's home. He may also be seen around the city being bullied by another child named Braith. You can speak to him about it, and he will offer to reward you with his life savings if you can convince her to stop. If successful, he will thank you from then on, now that Braith will not bully him or even look him in the eye anymore. Lars wears child's clothes and a pair of shoes. He carries a key to the clan's house, a key to the clan's farmhouse, a selection of food and toys, and a small amount of gold. Your adopted boys may comment on him: "Lars is such a milk-drinker. He can't even stand up to a girl." This page was last modified on 26 October 2017, at 11:41.